In this test, the motor is made to run without any load i.e. no load condition. The speed of the motor is very close to the synchronous speed but less than the synchronous speed. The rated voltage is applied to the stator. 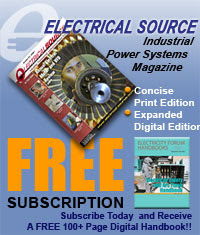 The input line current and total in put power is measured. 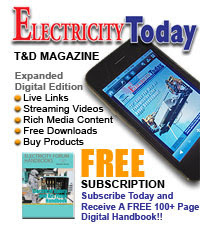 The two wattmeter method is used to measure the total input power. The circuit diagram for the test is shown in the Fig. 1. As the motor is on no load, the power factor is very low which is less than 0.5 and one of the two wattmeters reads negative. It is necessary to reverse the current coil or pressure coil connections of such a wattmeter to get the positive reading. This reading must be taken negative for the further calculations. This is no load power factor. Thus we are now in a position to obtain magnitude and phase angle of no load current Io, which is required for the circle diagram. 1. Stator copper loss i.e. 3 Io2 R12where Io is no load per phase current and R1 is stator resistance per phase. 2. Stator core loss i.e. iron loss. 3. Friction and windage loss. The no load rotor current is very small and hence rotor copper loss is negligibly small. The rotor frequency is s times supply frequency and on no load it is very small. Rotor iron losses are proportional to this frequency and hence are negligibly small. Key Point : Under no load condition, Io is also very small and in many practical cases it is also neglected. Thus Wo consists of stator iron loss and friction and windage loss which are consists for all load condictions. Hence Wo is said to give fixed losses of the motor. The no load losses are the constant losses which include core loss and friction and windage loss. The separation between the two can be carried out by the no load test conducted from variable voltage, rated frequency supply. When the voltage is decreased below the rated value, The core loss reduces as nearly square of voltage. The slip does not increase significantly the friction and windage loss almost remains constant. The voltage is continuously decreased till the machine slip suddenly begins to increase and the motor tends to stall. At no load, this takes place at a sufficiently reduced voltage. The graph showing no load losses PN.L. versus as shown in the Fig. 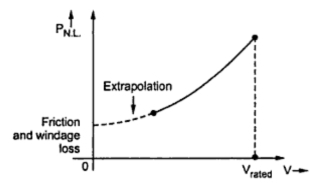 is extrapolated to V = 0 which gives friction and windage loss as iron or core loss is zero at zero voltage.